"Douglas Adams has taken millions of readers on wild excursions through time and space in his bestselling Hitchiker's Trilogy an Dirk Gently novels. Last Chance to See continues this tradition-but the time is now and every word is true. Douglas Adams and zoologist Mark Carwardine took off around the world in search of exotic, endangered creatures. What they found will by turns amuse, fascinate, and touch you. Join Adams and Carwardine as they encounter the animal kingdom in its stunning beauty, astonishing variety, and imminent peril: the giant Komodo dragon of Indonesia, the helpless but lovable Kakapo of New Zealand, the blind river dolphins of China, the white rhinos of Zaire, the rare birds of Mauritius island in the Indian Ocian. 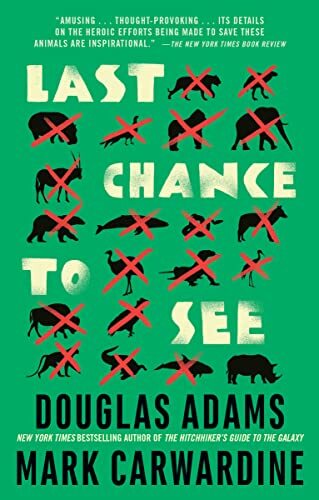 Hilarious and poignant-as only Douglas Adams can be-Last Chance to See is an entertaining and arresting odyssey through the Earth's magnificent wildlife galaxy." This was a really neat book. A quick read, it's only 221 pages. But it is interesting, hopeful and funny. It is not the usual depressing endangered-species based book. I really liked it, but it could have been longer and included more species. 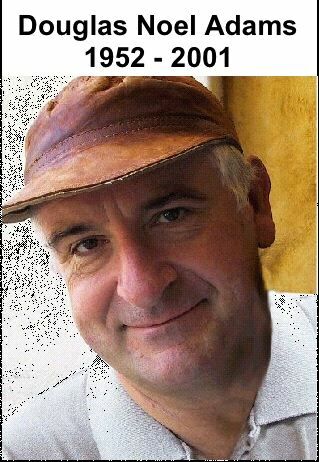 Unfortunatly Douglas Adams is no longer with us in flesh so there will be no more books from him. It is a great loss in my opinion. Received today, thanks! Look forward to reading this soon. Adams humorous perspective was a delight to read. While in China in search of the rare baiji dolphin, the crew decided they needed something to cover the microphone ... what else, a condom. Trying to explain what they needed at the local shops was just a hoot! Thanks so much for sharing this book. I've contacted scifitechguy and will mail out as soon as he responds. Hey! I got the book about, oh, 10 and a half hours ago, (2:00 pm on Fri. the 24th) but for those living in a different dimension, I might not have gotten it yet. Either way, I shall enjoy reading it, even though it wasn't quite what I expected (a science/space/whatever fiction/novel/story/something), I'm sure it will give me even more insight into the vast (or not-so-vast) recesses of Mr. Adams' mind. Anyway, this post is much too long already, especially for such a simple thing as announcing, "I've got it!" (Some dead greek guy said that once, I think it translates to "Eureka!" more or less; can you tell I like using parentheses (did I spell that right?)?) Where was I? Oh yes, post too long, K.I.S.S. So long, and thanks for all the fish, I know this will not be my last chance to see what DNA has cooking for my mind to digest. Apologies for the delay. I had lost track of time, then I lost the book, then I lost my place... It was a mess. Anyway, I enjoyed the book, though not as much as the H2G2 series, but Mr. Adams' unique view of life certainly adds spice to any story. There were several quotes I wish I had saved, and I wish I could remember them right now, darn. After finally finishing the book, I've PM'd the next person on the list, Chryso, and will send it along as soon as s/he replies with his/her address. So much for my speed-reading cap, heh. Sorry for the delay. This is the first I've read of Adams's works, and I love it. Adams brings the reader along on the journey, from foreign bureaucracy and backward airlines through forest and savannah and finally face-to-face with fascinating creatures. He experiences these things as we likely would, as a Westerner seeing them for the first time, filled with awe and wonder (except for the bureaucracy parts, which are another kind of awe and wonder altogether). I bought my own copy to share with friends and family, and I'm sure to read it again. Thanks so much for sharing this book, garnetfairy! This arrived in my mailbox today and bumps to the top of the stacks so I can get it moving along in the ring. Looking forward to it! A book about conservation and animals on the verge of extinction that's funny? Yes, this book is that but it's so much more. In 1988, Adams, of Hitchhiker's Guide to the Galaxy fame, and Carwardine, a zoologist combined to search out some of the world's endangered species for a BBC radio show and this is the book that resulted from this collaboration. They took 3 months and searched out Komodo dragons, kakapos (a NZ bird), Yangtze River dolphins, fruit bats, lemurs, northern white rhinos and more. The resulting book is an ode to these disappearing species as well as a bit of a funny travelogue. Adams has a great sense of humor and he uses it to full effect here. Underlying the current of entertainment, though is a sadness at what our (human beings') recklessness has wrought in the animal world. The good news is that efforts are being made to save these particular creatures but we still have a long way to go. This really was both worthwhile and fun reading, a combination that doesn't often occur, at least in my world. I didn't get around to posting that I'd mailed it but since it's already arrived, I won't worry too much about it! Got this today in the mail. Can't wait to dive in and check it out. Thanks for the bookring garnetfairy. Finished Last Chance to See last night. I have the address of the next person in line and will be sending it out on Friday. The most interesting parts of the book included the Kakapo (a flightless bird I had never heard of before), the problems of getting to and arranging the travel plans (one of the reasons I'm glad that there are some people willing to go through all that so we can get a chance to see a book like this as I would not), the story at the end of the book that involves books of knowledge, and last but not least the listings of the organisations you can write to and/or make a donation to. All in all an excellent book. 10-29-05 put into the mail on its way to the UK. Arrived safely today, thank you. I will apologise in advance that I have become rather inundated with work and also have a couple of other rings to read before I get to this one. I shall endeavour to read the book within the month, and there will be no delay in sending the book on as I already have nice-cup-of-tea's address. Fifteen years on and still the plight of some of these endangered animals goes on. Still the big monkeys threaten the survival off all other living things with whom they share this Earth. Have we learnt nothing? It is a shame that DNA did not live to see some of these creatures brought back from the brink of extinction. It is also a shame that some of the animals mentioned in this book are still not widely known about. I thank Douglas Adams and Mark Carwardine for their work that has stimulated me into finding out more about such creatures as the kakapo parrot, the baiji dolphin and the echo parakeet. What a great book! DNA's talent is in bringing characters and the animals so alive, and he has a nice line in self-deprecating humour and honesty! will pm niani today for her address. This book has arrived safe in Deventer, Netherlands. I just read the chapter on New Zealand (while drinking a really nice cup of tea, thanks!) and enjoyed it very much. We were there on holiday last month, and though we didn't get to see the komodo, we found quite a few other interesting animals. Thanks very much garnetfairy for sharing, and thanks to nice-cup-of-tea for sending the book to me. "As I watched the wind ruffling over the bilious surface of the Yangtze, I realized with the vividness of shock that somewhere beneath or around me there were intelligent animals whose perceptive universe we could scarcely begin to imagine, living in a seething, poisoned, deafening world, and that their lives were probably passed in continual bewilderment, hunger, pain, and fear." Nowadays, despite the efforts of the conservationists, the baiji are practically extinct. A lot of information about them can be found at this excellent website: www.baiji.org. At last this book is on it's way to Katayoun in Iran, I brought it to the postoffice last friday. Economy mail (sry, I'm sort of on a short budget right now) so it will hopefully arrive in a week or two. It took so long because we had some trouble in the PM-department, but finally I obtained the address. And a lovely picture of a very unique animal as well: the sock-eating monster-cow! You can see it here (we figured he might have something to do with vanishing PM's as well ;-) Great link Katayoun, thanx! an excerpt from my bookshelf "Feb 25: i'm sick and so i think would be behind schedule on the ring on 8-10 day. got the flu, but can't say only the flu cause there is no only about it; my cough would bring tears to the coldest heart, my tummy is doing the cha-cha and the temperature is havinf a field day at the roller coasters. and you'd think if one is sick and lieing down all the time then there is all the time in the world to read books, not so, it's lieing down and drifting in and out of sleep and not really having the energy to do anything. so sorry about the delay, well gotta go and do some coughing and moaning! :)" so sorry for a bit of delay. the most wonderful book, this was great. i knew i liked douglas adams alot but he's simply great and all the time i was thinking he's also not here anymore, compared to 300 million, we don't have all that much here also and yet it seems that according to this book we do are best to create as much havoc and carnage as we can :( ... i loved the book, didn't say that i was too proud of myself or liked myself all that much after reading it. mailed to garnetfairy today, it should take (touch wood!) not more than a month to get there. happy sailing. thanks everyone again for a lovely ring. Hurray! The book made a world tour and landed back home today. Thank you katayoun for the extras you put in with the book. They are most appreciated! The bookmark is just fabulous!! and now I have some stamps from Iran for my collection as well as the banknotes (gee I hope they are inexpensive)!!! and a pretty postcard too. I am glad everyone enjoyed the book! I think it is an important one. I want my son to read it next...who knows, maybe it will be a ring again someday if there is interest. Take care everyone! Happy reading! !